12.5" RCOS @ ~f/9 (2880 mm fl) at 0.64 arcsec/pixel. Shown at 1.63 and 0.96 arcsec/pixel. 4/12/2015 to 5/18/2015 Chino Valley, AZ... with CCD Commander & CCDSoft, AOL guided. eXcalibrator v4.30 for (g:r) color balancing, using 22 stars from the SDSS-DR9 database. PixInsight processing includes registration, stacking and data rejection for the luminance, gradient repair and non-linear stretching, with HistogramTransformation, for both the Lum and RGB images. Finally, selective use of HDRMultiscaleTransform, with various layer counts, was used to enhance the detail of the galaxies. PhotoShop for the LRGB combine and final touch up. The galaxy is shown rotated 60° clockwise. Located in the constellation Virgo, Messier 90 is one of the largest and brightest galaxies in the Virgo cluster. At a distance of about 59 million light-years the galaxy is blue shifted, indicating that it is moving towards Earth. To the right, is the irregular galaxy IC 3583. This galaxy is about 65 million Light-years from Earth. 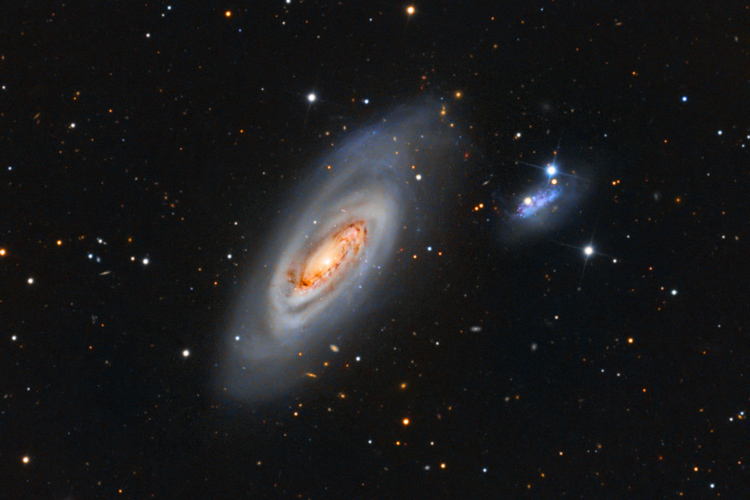 The two galaxies are an interacting pair with IC 3583 considered to be a satellite galaxy. The image also contains over 1800 easily visible galaxies down to magnitude 22.5.